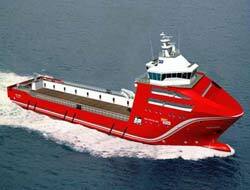 Norway's DOF ASA has ordered an an innovative LNG-powered platform supply vessel from Aker Yards. On delivery, scheduled for December 2010, it will go on charter to Statoil Hydro ASA. DOF CEO Mons Aase says this is DOF's first LNG vessel and "a natural development in the company's strong focus on environmental friendly, competitive vessels." Designed by Aker Yards Project in Alesund, Norway, the Aker PSV 06 LNG vessel will be built at Aker Yards in Norway. The 94.0 m x 20 m vessel will have a deadweight of 5,000 t and accommodations for 25 persons. It will be equipped with three 2,500 kW dual fuel engines able to run on both LNG and regular marine diesel. By using environmentally friendly LNG propulsion, the engines can reduce NOx emissions by 85-90 percent in addition to significant reductions of CO2 emissions. Aker Yards says that the patent pending design solution is unique because the LNG tank does not reduce cargo capacity for the vessel, rather the new design has a higher cargo capacity than other vessels of the same size. "This is an important order for Aker Yards," says Roy Reite, President of Aker Yards, Offshore & Specialized Vessels. "LNG is a technology in which we already have a strong track record. Today's order confirms our strong position in environmentally friendly propulsion. We are particularly proud that we won in contest with a number of other strong yards and designs."